Please click HERE to jump to my WEBSITE! 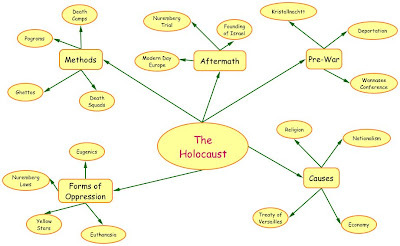 The concept map that I created is intended to show both the causes and the outcomes of the Holocaust. I must admit that I do not like concept maps. I often find that the type of information displayed in these things is either too basic or too convoluted to actually help with my understanding of a subject. In order for me to get something I need a detailed foundation of information on which to build my understanding. To me, concept maps do little in the way of elucidating a subject. I would be very interested to hear from someone who finds them helpful, as I assume, due to their extensive use, that they are useful to some people. 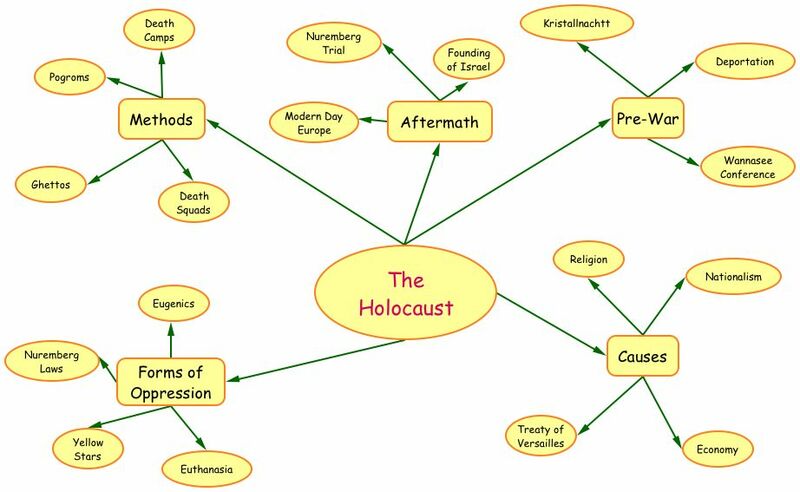 In this case, I chose to break the Holocaust concept map into four outlying areas: the underlying causes, the pre-war buildup, the methods used to carry it out, and the aftermath. I feel that by doing it this way I am able to address content standard 1 for Historical Thinking. 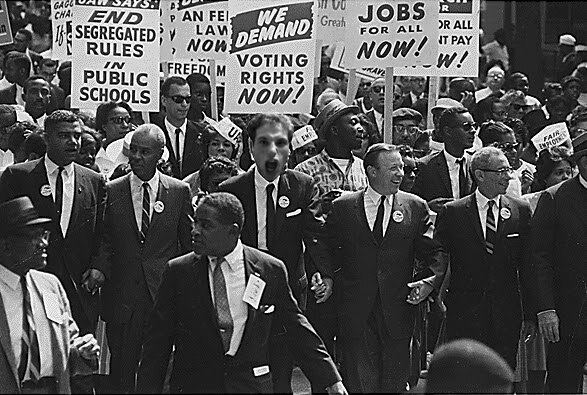 The picture that I chose to manipulate was obtained through Creative Commons and involves placing myself into a group of protestors at the 1963 March on Washington for Jobs and Freedom, the demonstration where Martin Luther King Jr. gave his famous “I Have a Dream” speech. I felt like using this image would provide a number of interesting points of discussion. In addition to addressing the speech itself, the students would have an opportunity to reflect on what it would be like to participate in such a momentous event. Topics of discussion could involve what it would be like to be oppressed, what it would feel like to be at the rally, and how would someone have helped out in the fight for civil rights. Throughout my schooling a large portion of the most helpful knowledge I have gained has come through inquiry based learning. Off the top of my head I can think of a number of projects that, rather than forcing us to memorize information, focused instead on presenting us with a problem and than asking us how we could solve that problem. One good example took place in 4th grade and involved a unit on the history of map making. The first thing our teacher did was take us outside and tell us, “I am looking at a rock right now. It is right next to a smaller rock. I am going to give you 15 minutes to find it.” We spent 15 minutes furiously searching for the rock she was referring to. When our time was up she brought us over and asked us if any of us had found the rock. When we all said “no” she asked us what would have made the task easier? We eventually realized that due to the almost infinite number of rocks on the playground, the only way we could have found what she was looking for was some sort of diagram, or, a map. The next step in the lesson involved the ways that maps were used throughout the ages. We were shown a number of maps used by different cultures, from the Polynesian stick maps, to the Roman land ownership maps, to a modern day road atlas. We were then tasked with figuring out why the respective cultures used such a wide variety of maps. This led to us having to research the important aspects of the particular society, and what the map represented. For the Polynesians, stick maps helped to show the water currents and wind patterns that their ocean-going culture relied upon. The Romans needed property lines to establish individual land ownership. The modern atlas was used to illustrate how vast and important present day transportation is. From this, rather than just learn about how maps are different, we learned how they could tell us important information about who used them. We were than asked to build one of the three maps we discussed. The final step of the project was to create our own country and represent it with a map. To do this we needed to discuss the land area, the population, the flora and fauna, and the geography. All of these subjects were connected to the math and geology lessons that we were working on at that time. Through this lesson based on an inquiry approach we needed to research different subjects, work in groups, ask questions, and create models, all fundamental to inquiry based learning. A more recent example of inquiry-based learning involves a class I took in college called Public Policy and Administration. Our main project was not to just write a paper on how policy is enacted and administered, but to form our own congressional committees and attempt to pass a budget for the National Parks Service. To do this we needed to learn about the senators and congressmen we were representing, figure out what their distracts would want, compromise with others in congress to get pet projects included, decide which projects to cut, etc. This approach to learning allowed us to experience the process rather than just take notes. In my own classroom I would want the majority of my curriculum to be based on an inquiry-based model. I would like to teach social studies, so combining an inquiry-based approach to the historical thinking standard would be one of my main goals. One benefit of the inquiry-based approach is that it allows for a strong emphasis on a multicultural/social justice curriculum. One of the most important aspects of an inquiry based learning model and a multicultural education based on social justice is the need to develop questions that test established ideas. Within the arena of social studies, there are a number of ways to do this. For example, asking, “Did Columbus really discover America?” This question would force students to think beyond the normal euro-centric view of world events. They would need to consider the fact that there were already people living on the continent with their own rich culture and history. Next, you might ask them to write a story about what it was like for the native-Americans to have their land overrun with new people. If you were teaching a unit on civil rights you could ask the children what it would have been like to have to drink at separate water fountains. You could have them question the science behind craniometry and how misguided science can be. There are an almost endless number of ways to get kids to “Question Authority,” which is one of the most important aspects of inquiry-based teaching.